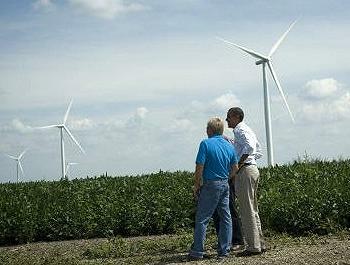 HAVERHILL, Iowa, August 15, 2012 (ENS) – President Barack Obama used his Tuesday campaign visit to an Iowa farm that hosts wind turbines to slam his opponent, Mitt Romney, for his failure to support the wind energy production tax credit. The tax credit expires on December 31 unless it is reauthorized by Congress. Farmers Richard Heil and his son Jeff showed Obama their wind turbines, recent additions to the land the Heil family has been farming since 1902. The Heils formed a community cooperative with neighboring landowners to establish the Laurel Wind Farm, 52 wind turbines on 20,000 acres of land, which now power an estimated 30,000 Iowa homes. Obama contrasted this campaign visit to the area with his 2008 campaign visit to nearby Newton, Iowa when the local Maytag plant was closing, throwing nearly 2,000 people out of work. Since then wind energy has offered those Iowa workers new job opportunities. 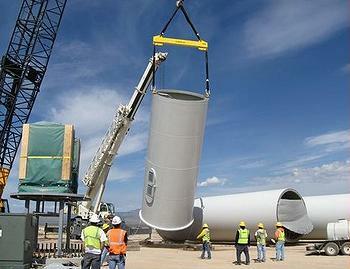 There are nearly 400 wind-related manufacturing facilities in the United States today, compared with just 30 in 2004. But the wind energy industry is worried that Congress will not renew their production tax credit, a fear that Obama recognized in his remarks at the Heil farm. “I think a lot of folks in Iowa would disagree, because wind farms like this and the good jobs that are down in Newton, they’re not a ‘fad’ and they’re not ‘imaginary,’ Obama said. Today, wind-energy production supports 75,000 American jobs, including 7,000 jobs in Iowa, more than in any other state. Iowa gets about 20 percent of its electricity from wind. The National Renewable Energy Laboratory estimates that wind projects across the country created at least 52,000 jobs between 2009 and 2011. The Congressional Research Service reports that the country will add a record 10 to 12 gigawatts of capacity by the end of 2012. The production tax credit provides an income tax credit of 2.2 cents per kilowatt-hour for the first 10 years of electricity production from utility-scale wind turbines. A recent study by Navigant Consulting found that extending the production tax credit will allow the industry to grow to 100,000 jobs in four years, while an expiration would kill 37,000 jobs within a year. Throughout the Midwest, wind turbines are providing income for farmers hard-hit by drought and looking at their crops standing dead in the fields. Yet, Shawn McCoy, a spokesman for Romney’s Iowa campaign, told the “Des Moines Register” July 30, “He will allow the wind credit to expire, end the stimulus boondoggles, and create a level playing field on which all sources of energy can compete on their merits. “Wind energy will thrive wherever it is economically competitive, and wherever private sector competitors with far more experience than the President believe the investment will produce results,” McCoy said. “That’s not imaginary. That is real. And that’s what’s at stake in November. Thirty-seven thousand American jobs are on the line if the wind energy tax credit is allowed to expire like my opponent thinks they should,” Obama said. In late July, the Senate Finance Committee drafted legislation that includes a one-year extension of the federal wind energy production tax credit. Senator Chuck Grassley, an Iowa Republican, authored the legislation that created the wind-energy production tax credit in 1992 and has won passage of extensions a number of times. Wind energy drives as much as $20 billion in private investment, according to the American Wind Energy Association, an industry trade group. During the last five years, 35 percent of all new electric generation in the United States was wind.